La Union is the official ‘Hipster’ capital of the Philippines and the un-official surfing center, despite the fact that most seasoned surfers would be very disappointed by the surfing breaks here. This is a great place to be if you are a back-packer looking to meet other back-packers in the Philippines, as well as meet the ‘hipster’ scene from Metro Manila. Located about 8-9hrs north of Metro Manila by coach from Cubao La Union, like Baguio is difficult to reach Metro Manila and return within one day. However, the overall vibe in La Union is very laid back and chilled and because of all the tourists coming here from Manila there are plenty of facilities catering to the needs and wants of Digital Nomads. Want to set up as a Digitial Nomad in Baguio and not sure where to start? Get in touch with us now and we can help you get settled. Want to search all available flights to the Philippines? Check out Jet Radar now for the best flights and the cheapest prices! Discover the “quiet side of La Union” where guests can enjoy beach side luxuries and undisturbed me-time. Aureo’s beachfront property offers privacy and endless moments of pure serenity while offering guests the luxury of exploring the other best-kept secrets of La Union. Aureo is a sprawling resort that brings a distinct brand of luxury, your La Union holiday. Everything in the property is designed, built and intended to pamper you. The mantra is the world revolves around you. And we make this your holiday reality through our well-appointed suites, impeccable service, world-class flavors and on-shore amenities as well as activities. 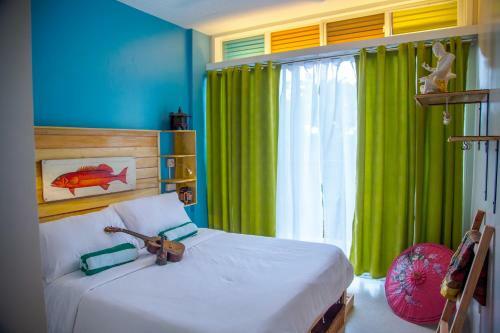 Featuring free WiFi, Flotsam and Jetsam Hostel offers accommodation in San Juan, 40 km from Baguio. Guests can enjoy the on-site bar. Free private parking is available on site. Free WiFi is provided in the kitchen and bar. Certain rooms include views of the sea or garden. Lockers are included in the room. Guests have access to the shared bathroom. There is a 24-hour front desk, luggage storage space and gift shop at the property. This hostel has water sports facilities and bike hire is available. Guests can enjoy various activities in the surroundings, including snorkeling and hiking.